My students are desperate for dystopian novels. Since I am looping with my same students from last year, they already read my usual suggestions. This means it's time for me to branch out in my dystopian reading so that I can make better recommendations. 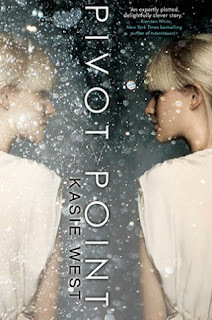 This led me to Kasie West's Pivot Point. There's a reason why this is in my second swoop of dystopian reading: it's not quite as suspenseful or action-packed or well-written as the first round picks. Still, it's clever and I think readers will enjoy it. Addison lives in a community where everyone has paranormal powers; her mother has powers of persuasion and her father is a "human lie detector." Addie is divergent (an unfortunate power now, due to the far more popular series), which means she can see both outcomes of a potential choice. I love "Sliding Doors" scenarios and was excited to see it applied to a YA novel. When Addie's parents separate, she must decide whether to stay in her community with her mother, or move to the normal world with her father. From there, we get to see both consequences of her decision, thanks to Addie's divergence. I love the idea, especially living in an X Men style community where everyone has powers. One of my favorite parts of all X Men movies is when they are just showing off their powers, so I could have used more of that in this novel. Unfortunately, we don't see much of them, and when we do, they are kind of confusing. There is a fairly large plot point surrounding a friend's drug addict father and several characters use their powers to get ahead romantically, so those place it firmly in the middle school category of books. Still, I think my students would enjoy reading this at the end of sixth grade. I'll keep it in my back pocket for a book talk at the end of the year.